​My name is Lee Jackson (46 years old) and I have fished the Santee Cooper lakes for over thirty years or as my mom says, " ever since he was old enough to hold a fishing pole". I do it because I LOVE FISHING, period!! Even though it is classified as a job, I just enjoy being on the water. It isn't unusual for us to catch a cooler full of catfish, watch multiple bald eagles throughout the day, and see a 8 or 10 ft. alligator on the way in. How could you not enjoy that?I don't care if I am out catching bait or watching my clients catch fish it is just something that I really am pasionate about. Fishing and hunting are about the only two things that I do outside of spending time with my family. I am certified by the US Coast Guard to carry up to six people and I'm CPR and First Aid certified as well. I am married with one apple of my eye (she is 15 yrs. old). My lifetime dream was to own a home on the santee cooper lakes. In 1997 my wife and I purchased a home on lake Marion and we have lived here on the lake full time ever since. The lake has gone through a lot of changes over the years but we still have one of the best fisheries in the world! Living on the lake full time offers several advantages as you can imagine. Living on the lake allows me to operate my own bait house as well so we never have to worry about who has the freshest bait! If I'm not on the lake fishing, chances are that I am out catching bait either for myself or for some of the other fellow guides. I just love being on the water and there is nothing that I would rather do than witness a child land the biggest fish of his or her life. I know first hand that those memories will last a lifetime! Catfish on the world famous Santee Cooper lakes with Capt. Lee Jackson Professional fishing Guide Capt. 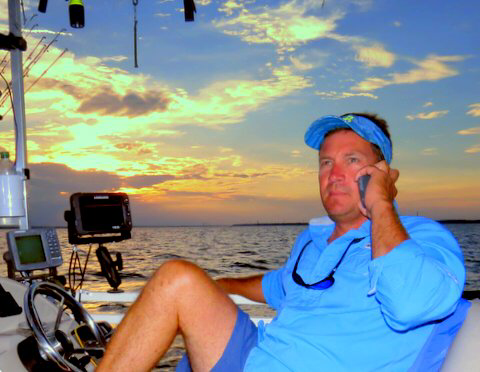 Lee Jackson offering catfish charters on the Santee Cooper lakes in South Carolina.